Innovation, even in big companies and massive organizations like the military, can be accomplished with some ingenuity, and the courage to implement programs first and ask forgiveness later. 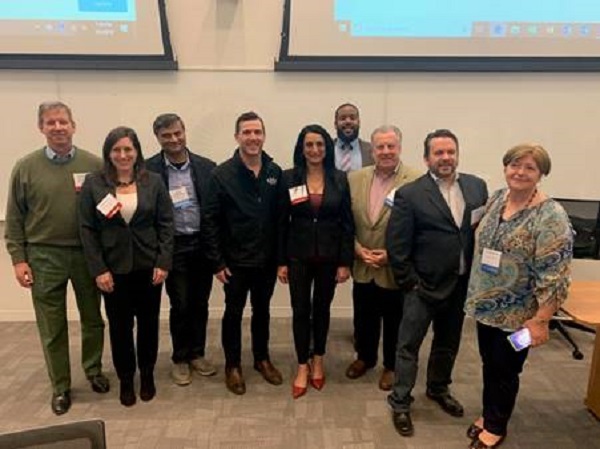 That was the message from representatives of a startup, a large company, the military and academia at the Montclair Entrepreneurs meetup on Sept. 20. The meeting took place at the Feliciano School of Business, Montclair State University. The panelists included Tony P. Burgess, retired colonel, U.S. Army, and independent leader developer; Amy Powell, VP of global leadership and associate development, ADP (Roseland); Todd Tauber, VP of product marketing, Degreed (San Francisco, Calif.); and Dennis M. Bone, inaugural director of Feliciano Center for Entrepreneurship, Montclair State. Powell also acted as moderator. ADP is the world’s largest provider of outsourced payroll and human-capital-management services, with more than 56,000 employees, over half of them outside the U.S. As can be imagined, ADP is a vast organization focusing on delivering value to shareholders. Yet the company also wants to deliver on innovation, Powell said. One of the innovative programs the company touts is an internal social site that connects experts in different areas of the business. “We have a social collaboration site that’s like if Facebook had a baby with LinkedIn behind a firewall,” with a business agenda. The site hosts different groups with specific areas of expertise. For example, there is a group of 4,000 people who just talk about career growth and development and share ideas about how to get their next promotion within the company. “We also started engaging our clients in social platforms to give each other advice.” So, in addition to calling into our service center, clients who have figured out solutions and best practices can help others on this site. Tony Burgess spoke about his experience in the army. While he had an entrepreneurial bent before he entered West Point, “I fell in love with leading soldiers and building amazing teams” and being part of something bigger than himself. “What I needed to do was find a way to activate my entrepreneurial side inside this hierarchical structure.” When he was preparing to be a company commander in the army, he spent a lot of time with seasoned company commanders, taking them out to lunch, asking them what went well for them and what were their best ideas. This was done 100 percent outside of the hierarchical structure of the army, because it needed to be done. “It was really cutting-edge and a little dicey at times” in terms of what they were doing outside of the structure, he said. For instance, they interviewed company commanders in Iraq and Afghanistan about their most challenging experiences and then disseminated that information through the website. Burgess said that some of that information saved lives. Tauber said that Degreed is disrupting and innovating in a different way. The world of work has changed, he noted, and employees now have to keep educating themselves in different ways. Degreed presents a portal to videos, lectures, massive online courses, podcasts, magazine articles, etc. on various topics; and it provides employees with a way to show that they’ve read the articles or taken the online courses, so they can add their training to their credentials. “By cataloging and indexing them and making it a social experience, we are able to allow people to find learning experiences that are meaningful to them and make sense for their goals and their careers,” Tauber said. “The other thing that changed is the contract between companies and employees,” he noted. Companies are quick to get rid of people when they no longer suit their purposes. “I’m not moralizing about this,” he said, but it means that individuals need to own their own careers. On Google, companies talk more about human capital management than they do investment in the workforce, he added. Degreed also helps organizations hire people with the right skills, though the skills might not have been acquired through the usual methods. It’s a way for people to show the skills they’ve acquired through nontraditional means. Software, artificial intelligence and machine learning are going to “transform business after business; it’s going to transform us.” Even some of the big things that are coming, including driverless cars, will get here and disrupt many businesses, he said. Business schools should be preparing our students for this world, Bone contended. Corporations have to make decisions much more quickly. They have to be much more empathetic to what’s going on in the environment, and they have to understand the problems they are trying to solve and understand how to solve them. Corporations used to be able to consider ideas for two years before they’d implement them. Now they will be killed by an innovative startup that can implement the idea before them. For students, “the corporate ladder is turning into a lattice. The companies that are still using the corporate ladder aren’t the ones that are going to be here.” It’s the ones that can use everyone’s talent interchangeably, make decisions quickly and fail fast that will survive. Business schools have to be disruptive to serve that disruptive world, he noted. In order to address this, schools have to teach students by using interdisciplinary, cross-functional teams. These kinds of teams will solve problems better because they look at the problem through different lenses and prepare students to solve problems in companies.